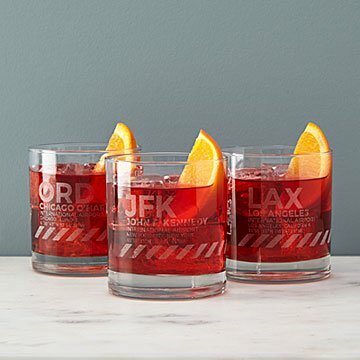 Toast air travel's romance with these glasses, etched with terminals and runways of five US airports. Stranded by a blizzard at O'Hare, Ms. Negroni eased your shyness while you chatted with interesting strangers. Then there was the Old-Fashioned at LAX you'll never forget, because THE movie star walked by, mid-sip. Back at home, pour yourself one in this rocks glass and slip into that anything-can-happen air travel reverie. Created by Boston-based designer Brian Johnson, the etched glasses feature terminals and runways of five major US airports. You won't have to slog through security, but you may feel like taking your shoes off anyway. Choose JFK, LGA, ORD, LAX, or BOS. Glasses made in Ohio and etched in New Hampshire.